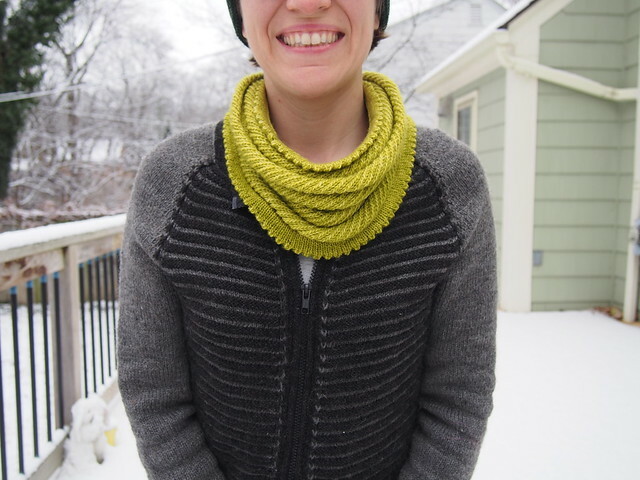 A couple of years ago, I got it into my head that I needed to knit myself an Elle Melle; I’d so loved the one I knit for M, both the knitting of it and the look of the finished sweater, and I wanted one in grey and black. I had nearly finished it, and then it got buried under other things and I didn’t rediscover it until recently, while trying to reorganize things after our move. 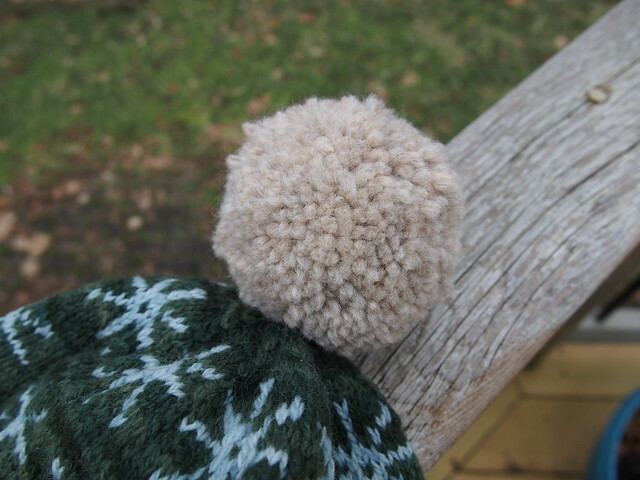 It turned out that all it needed was to have the ends woven in, and to be blocked, and then to have a zipper installed. 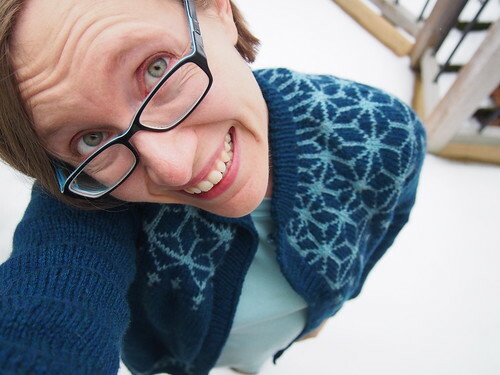 So now, thanks mostly to the efforts of 2-years-ago me, I have a finished sweater! Time to knit: Ha! Well, if we go from start to finish, two full years, but it was buried under other stuff for the vast majority of that time. 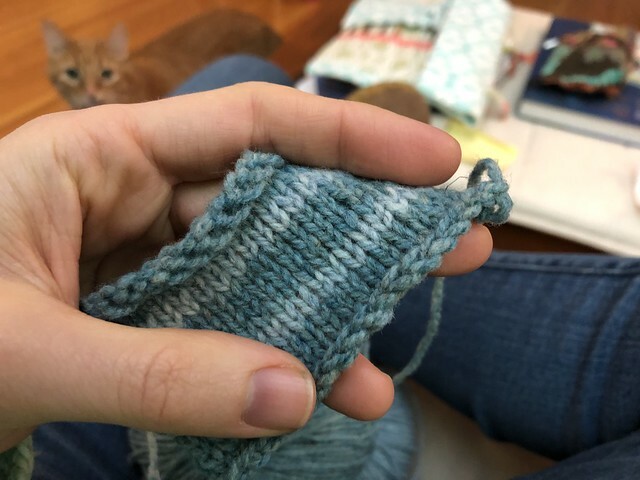 I can see why I set it aside at the point I did – there were a LOT of ends to weave in, because the Mohawk yarn had a ton of breaks in it. 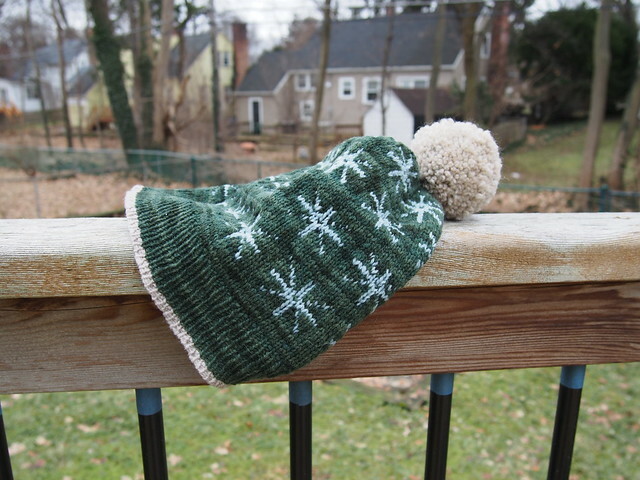 It almost seemed to have been nicked by a box cutter or something; it was a rather frustrating experience, and made me wish that I’d gone with my first intuition and knit it with Beaverslide Sport/Sock. 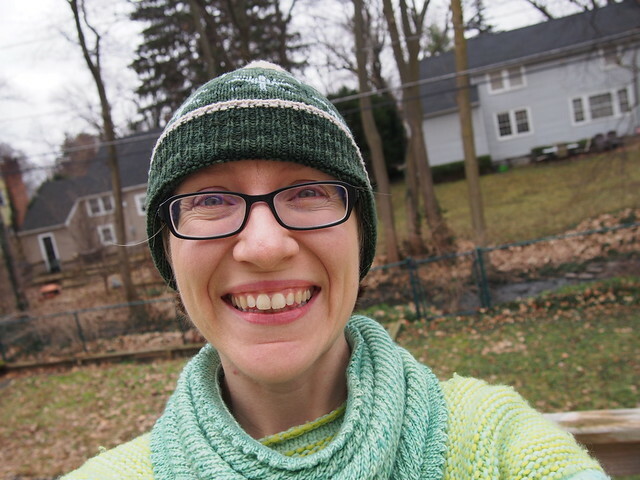 But I’d wanted to try a new-to-me yarn, and it is a very nice, warm sweater now that it’s done. The other reason I let it linger was that I was really dreading putting a zipper in. It just intimidated me! It took me most of the afternoon and evening yesterday, but I did it! I desperately need new glasses; the “hold it inches from face” method was quite hard on my neck! 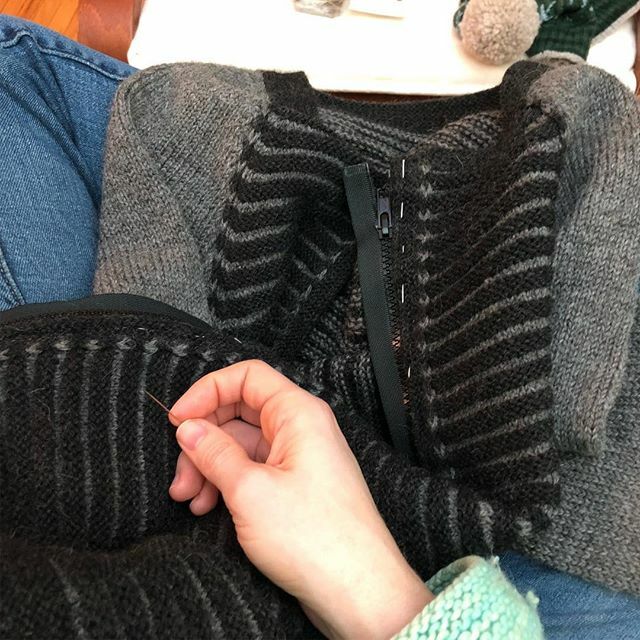 My stitches weren’t the most beautiful – it’s really freaking hard to see what you’re doing when you’re sewing on a black zipper to a black zipper facing with black thread! But look, it’s a functional zipper! I’m really quite proud of my first successful zipper installation! 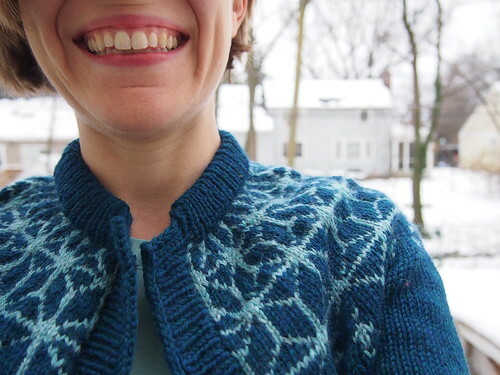 M has requested a zipper on her Octopus Yoke cardigan, so I’m also glad I got a chance to practice on this sweater! 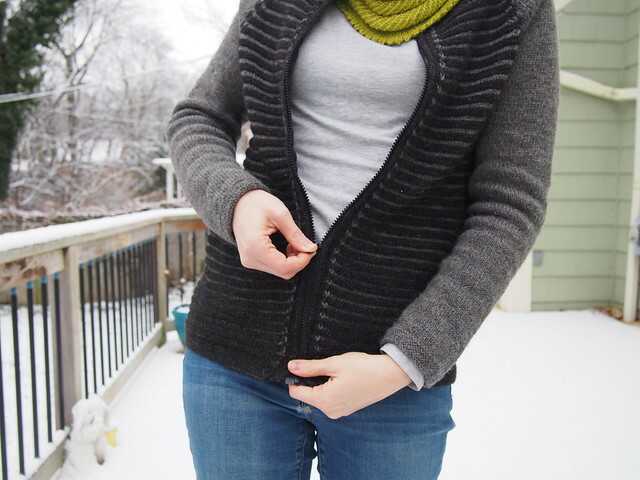 As much as I love the look of Elle Melle, I don’t think raglans are the most flattering style of sweater for me; I’m really broad shouldered but otherwise petite, and raglans seem to amplify the broadness of my shoulders while making the rest of me look boxier than I am. But I do think this is a going to be a cute sweater to wear. 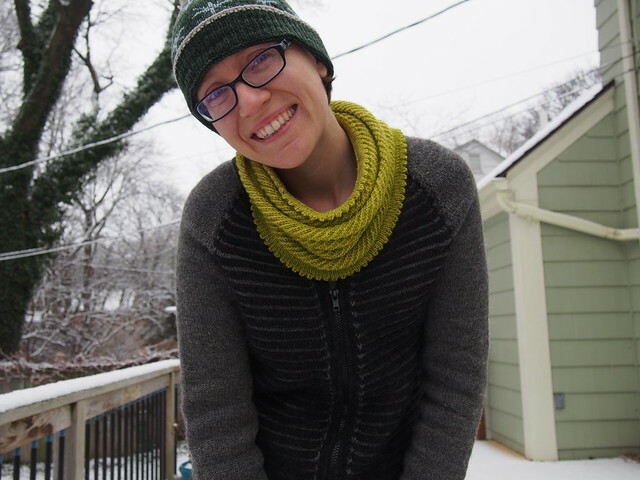 It turns out to be mighty difficult to get good photos of a sweater when it’s just you and your self-timer, on a cold snowy day. 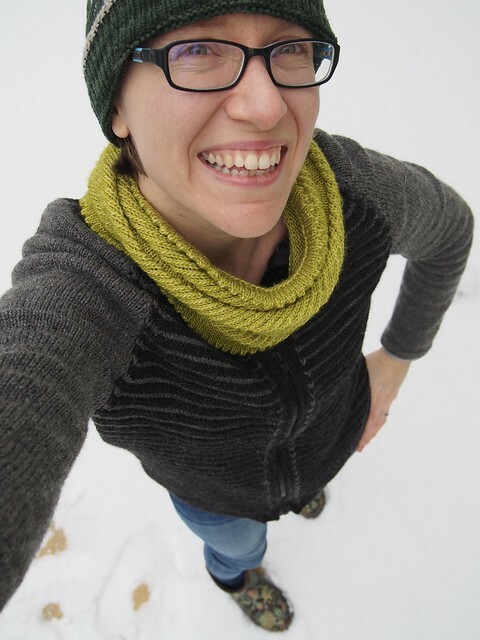 But the snow did make a nice background! The hardest is getting a photo of your own back with just a self-timer. This was the best I could do, and it’s not quite in-focus. Oh well! All-in-all, I’m pretty darned pleased with how this turned out! Hooray for Elle Melle! 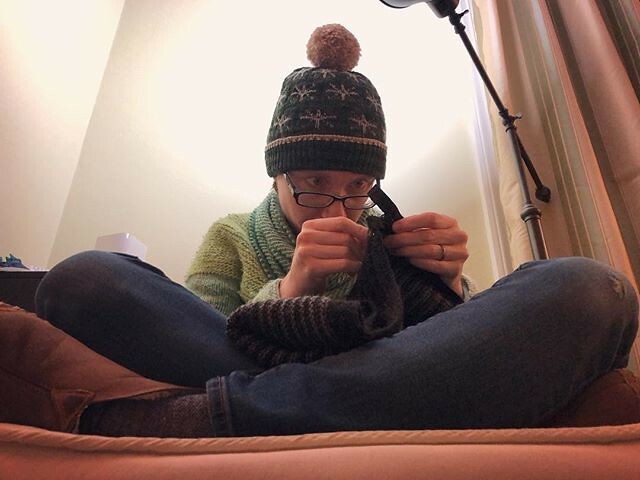 As of this moment, I don’t currently have a sweater on the needles, which is very rare for me! 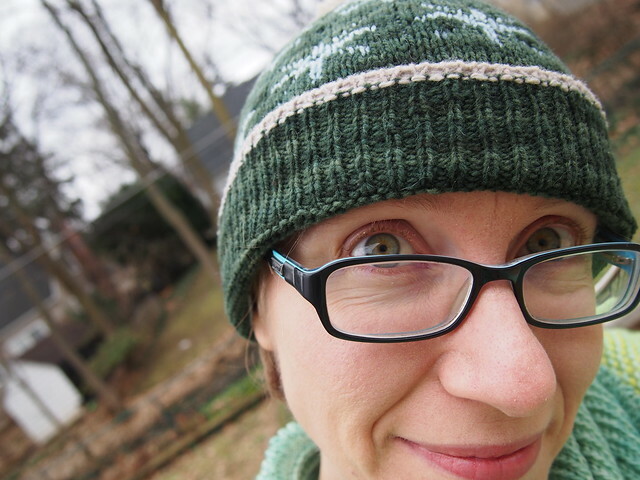 I do plan to cast on soon for an Octopus cardigan for M, but for now, my attention is centered on a hat! 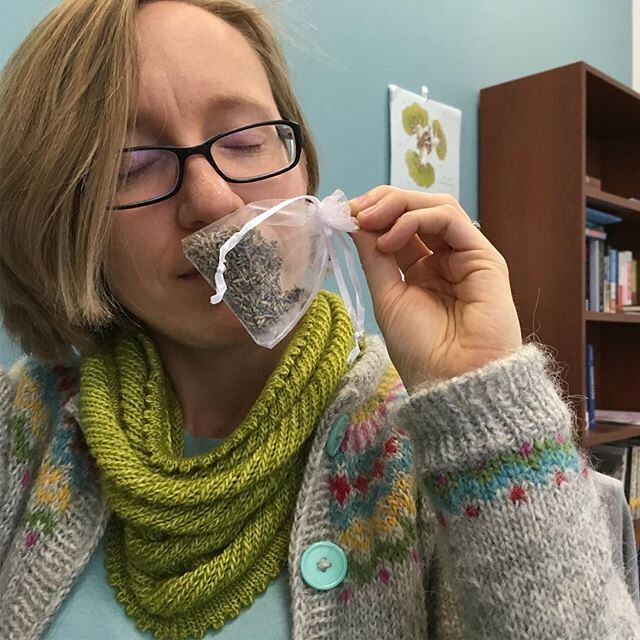 I got this at the kickoff meeting for my university’s new “Mindful University” project, and it really does impart a delightful scent to my wool. As part of this project, I recently applied to be trained as a Koru Mindfulness teacher, which is something I think I would really enjoy doing. We’ll see how that goes! 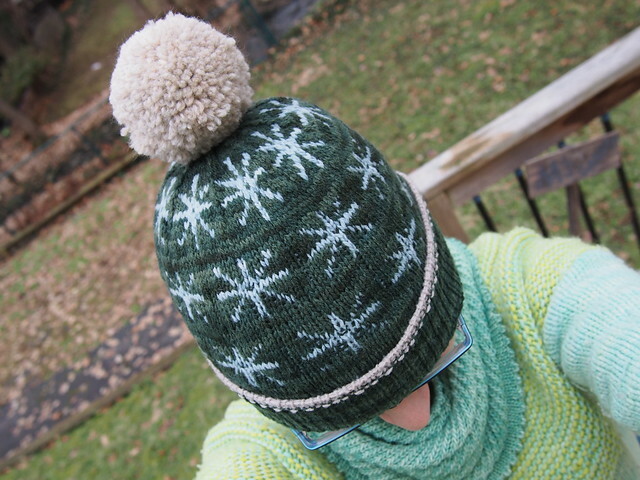 Anyway, the hat is moving along nicely; the floats in this pattern are incredibly long in some places, so I’m trying to catch them, but worry that my caught stitches will kind of show through when the hat is stretched. 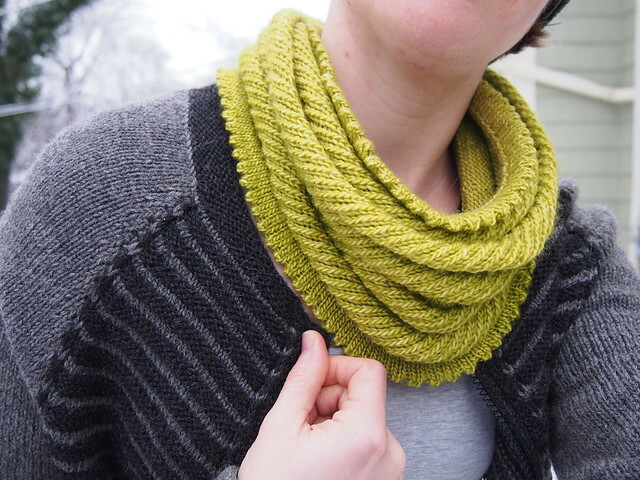 We’ll see, though – I think the wool will bloom quite a bit when blocked, so that might counteract it a bit. I think these colors are really great for me – the pine green + light blue + light brown matches the mix of colors in my own eyes really nicely! 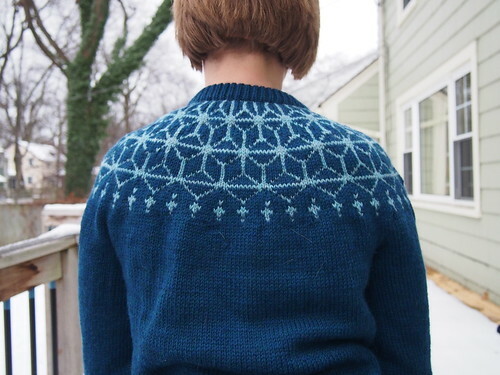 I know that the pattern is called “Asterisk”, but I actually think they kind of look like snowflakes, too! 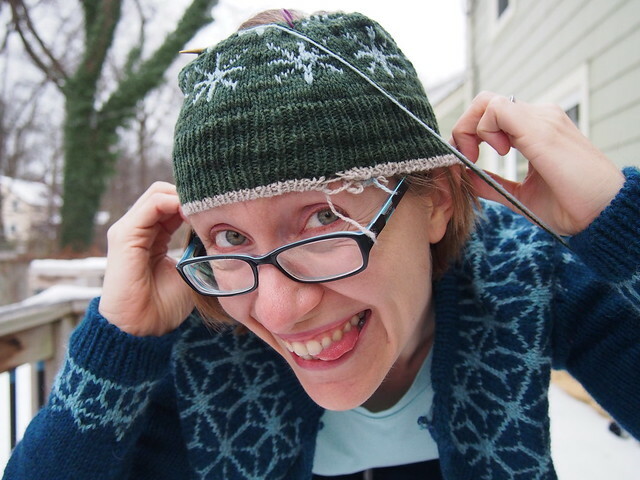 I’m using this hat as a little bit of a reward system for grading; after I’ve graded 3 portfolios, I get to knit 3 rows before going back to grading. So much grading! But the knitting helps it to go down a bit easier. The end of the semester has been especially busy, and as seems to be normal for me, I’ve been sick for most of it. The pileup of research paper feedback, Thanksgiving, and my daughter’s birthday is always a mess! 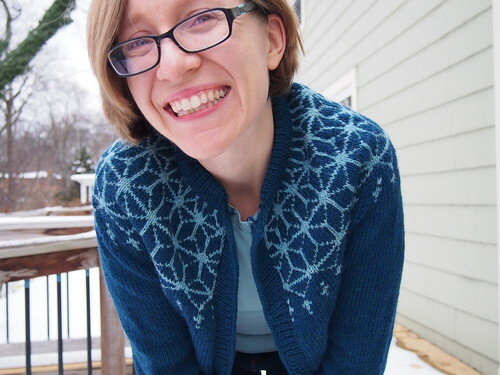 But somehow, in the midst of all of that, I managed to finish my Tensho cardigan! 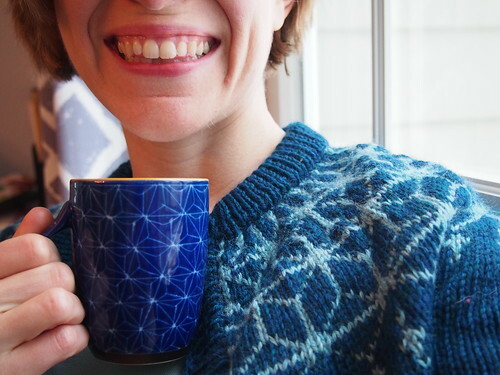 Pictured with the mug that inspired the knit! 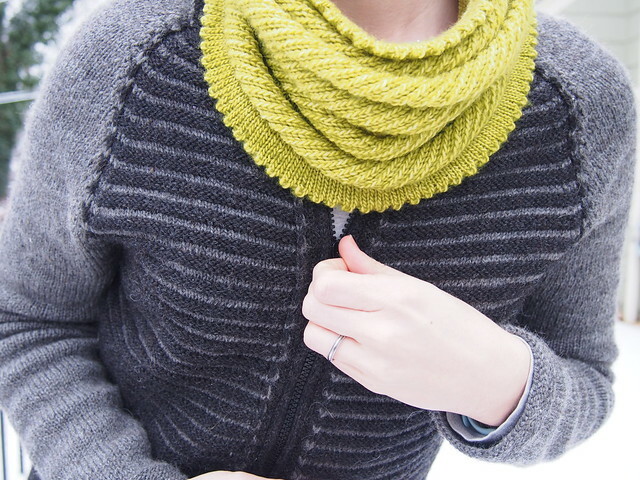 As you can see, I ended up deciding to go with a folded rib neckline, just like the ones I knit for Gamaldags, Winter Traveller, and Skógafjall. What can I say, I just really love the way they look and feel! 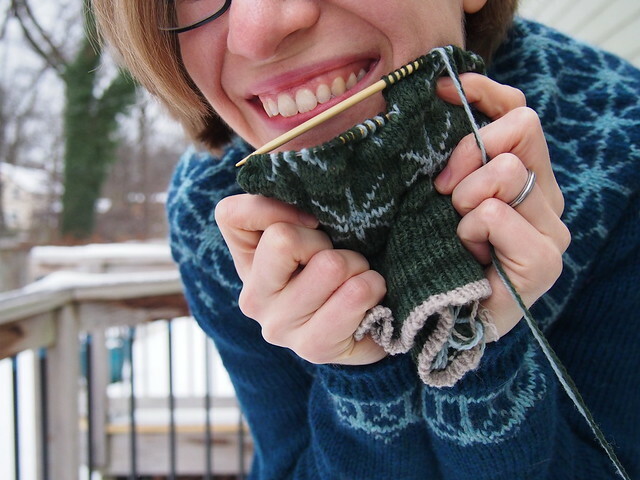 Another thing I did, which has become my norm when knitting yoke sweaters from other people’s patterns, is add a couple of short rows right below the collar in back – essentially, if you imagine where the “raglan” lines would be, I do the wrap&turns about where the front raglan lines would be, which raises the back neckline perfectly for me. I still need to choose buttons. 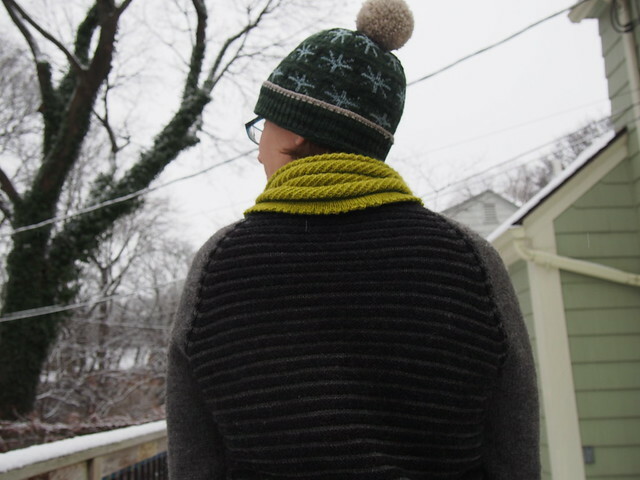 But before that, I need to decide whether I want to fix the fact that I put the buttonholes on the “wrong” side compared to what I normally do – it’d be easy enough to fix, since I did an i-cord bind-off buttonband, so not very much would need to be ripped and reknit. I’d also really like to cover the steek, but need to find a good ribbon or cloth tape to use. I’ve never done that kind of steek-covering before! With really sticky wools like Lopi I generally cut without any reinforcement and just leave my steeks raw, but for Cascade 220, a smooth worsted-spun yarn, I did a crochet reinforcement, and I actually would feel most comfortable with a ribbon covering, I think. 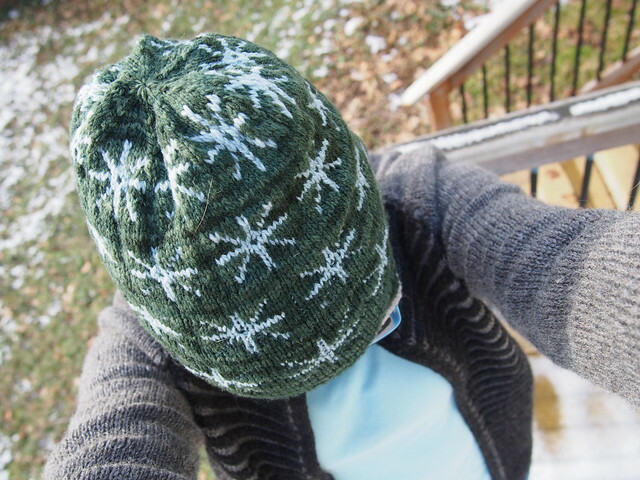 I didn’t get the best pictures, because trying to take self-portraits in a rush before the sun sets, when it’s cold and your deck is covered in snow, is just not ideal! But the snow does make for a nice contrast in the background. 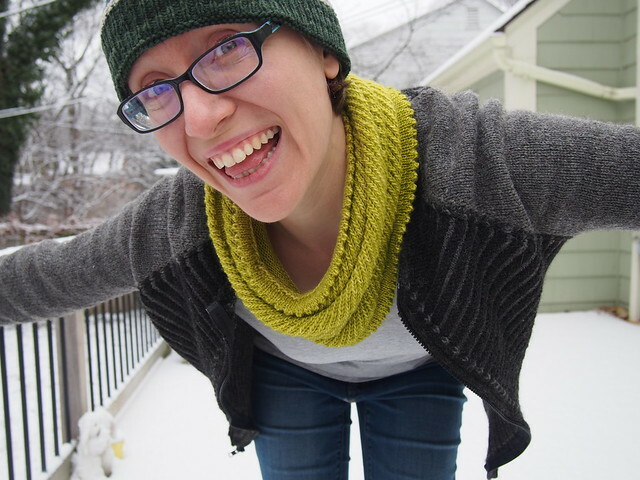 I’m really pleased with how this turned out, though in knitting it, I found myself wishing I were knitting with Lopi, or Beaverslide…something a bit more toothy and wooly than Cascade 220…and I think I’m feeling that wish when wearing it, too. 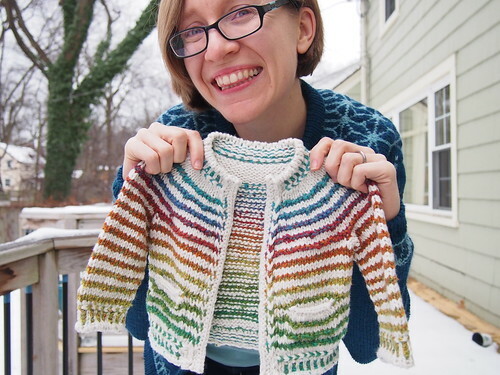 I wonder if I’d feel the same way if I’d knit it as a pullover (you know, as called for by the pattern) – I think I might want something a little “denser”/less drapey out of my colorwork cardigans than I do from a pullover. 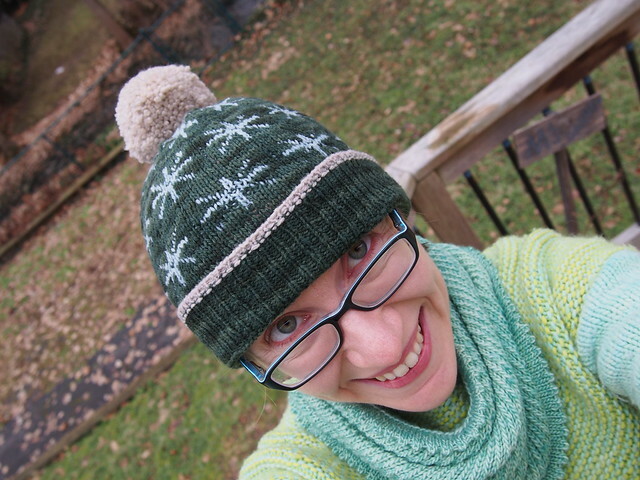 I’m sure I will still wear this one a bunch, but I wanted to note this for my future knitting self…I’m just a wooly-wool sort of person! But I’m glad I was able to put the leftovers from Andrew’s Seamless Hybrid to good use!